Eastern Sierra View #4 From near Vista Point in the White Mountains Inyo National Forest, Ca. And before me appeared a vivid blue, as above the peaks the white clouds flew. Like an band of angels riding high, they painted portraits across the sky. I stood in awe at natures door, as seconds passed till it was no more. I had reached a place that few men know, where angles dance above the snow. -(c)2001 L. Nollenberger. 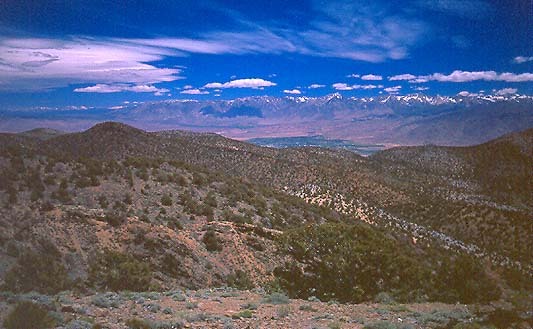 Shot taken just north of Vista Point along the Ancient Bristlecone Pine Scenic Byway in the White Mountains.